Before you set off to buy a juicer, it's helpful to get acquainted with the main types of juicers and how they differ from each other. How a juicer makes juice will contribute to important factors such as how long the juice stays fresh. 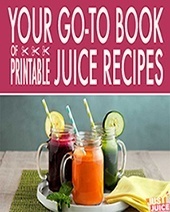 Different types of juicers will also determine the variety of produce you can juice, as well as vary in what you can use the juicer for - some are multifunctional and allow you to do things like make nut butters and even pasta. Of course, the type of juicer you end up choosing should be based on what you want to use the juicer for. As you read through the different types of juicers and how they compare to each other, keep in mind what you, specifically, are looking to do with your juicer. We say this because it's so easy to get distracted by all the bells and whistles of an awesome juicer (when all you want to do is make some apple juice) and end up buying something that's overqualified to do the job you're looking for. 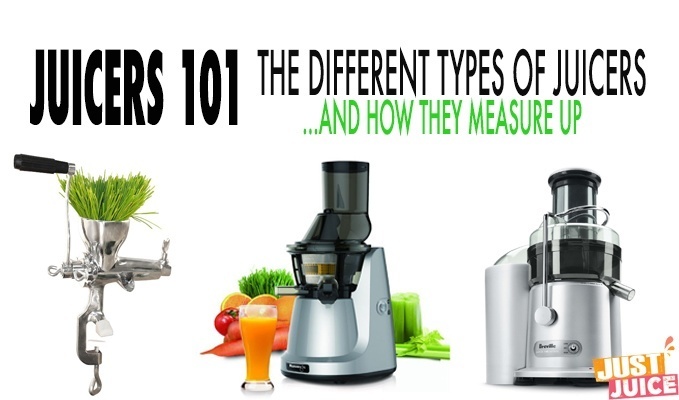 Here is a quick summary of the various types of juicers and how they stack up against each other! Centrifugal juicers are popular since they're the most available (readily found in all department stores) and usually the most affordable of the electric juicers. You can get an excellent one for the same price as the Z-star manual juicer. Still, it must be said that centrifugal juicers are easy to use and easy to clean - plus, they tend to be much faster at producing fresh juice than other electric juicer types. Find out more about the pros and cons of centrifugal ﻿juicers﻿! Some juicers don't recommend centrifugal juicers since they often produce more waste than other juicers and also cause the juice to oxidize faster. BUT - I think centrifugal juicers definitely have a place in the life of juicers who are really looking for an efficient juicer. I mean, it's great to have a wonderful juicer that produces really dry pulp and fresher-than-fresh juice, but if you don't have the time to use it because it takes too long to juice and then to clean up...what's the point? Even if the centrifugal juicer doesn't extract the full juice out of produce, it is fast, efficient, and really easy to use. It's perfect for someone who does not have a lot of time to juice but still wants a fresh cup or two every once in awhile. If you're going to get a centrifugal juicer, the Breville juicers are the best. 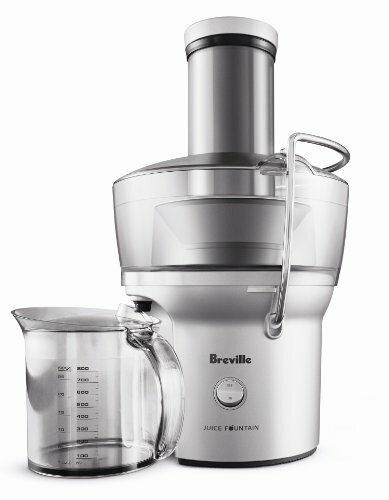 And out of the Breville juicers, the Breville BJE200XL Juice Fountain Compact Chrome Extractor is the absolute best value (at $99.99 on Amazon). 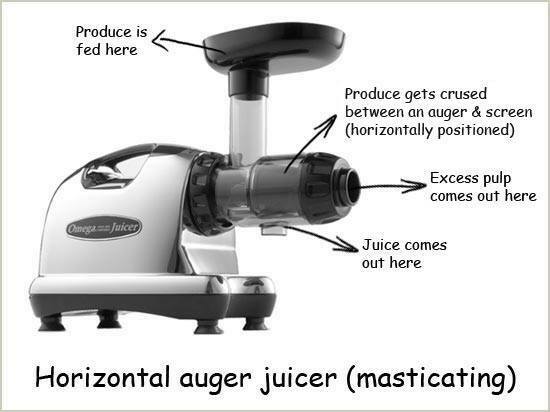 Unlike the centrifugal juicer, masticating juicers run at a much lower speed (so it takes longer) but the lower speed also produces little-to-no-heat and thus minimizes oxidation. That means your juices aren't warm (like they tend to be with some centrifugal juicers), there's no froth on your juices, and that most of the vital enzymes and nutrients in your juices are preserved from oxidation since the juicing process doesn't disturb the cellular structure of the produce being juiced. In the centrifugal juicer, on the other hand, the produce is chopped up (by a cutting blade) and then spun - which is not as effective in extracting juices - and thus results in pretty moist pulp. The heat produced by the high-speed spinning also degrades some of the vital nutrients in the juice. I don't like to play favorites, but yeah, single gear masticating juicers are my favorite and the first juicer types I recommend whenever friends or family ask for a juicer recommendation. Why? First of all, I find that these juicers provide the best overall value. 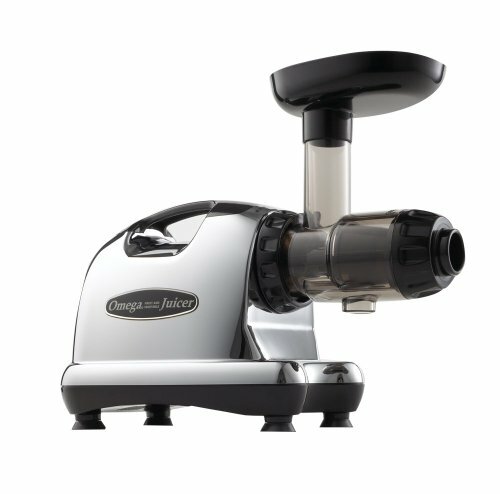 They are a little more expensive than some centrifugal juicers - you can get a pretty good centrifugal juicer for around $100 - whereas a good single gear juicer can run you around $250. It's a little more upfront investment, but you get it back. On top of this, single gear juicers last forever. The warranties are super lengthy and if you ask anyone with, say, a Champion, they'll tell you what a tank of a juicer those things are. I also like the fact that single gear juicers don't heat up my juice and produce no froth. In terms of nutrient content that's being preserved, I think a single gear juicer does add up to better overall value, not to mention the taste different. I do still use a centrifugal juicer sometimes when I know I can immediately down that glass of juice and I'm really running low on time, but if I plan on storing my juice for even a day or two, I will always opt for the masticating juicer. I know most juicers also do like to store their juice so they can take it on the go and for stored juice, single gear juicers are the way to go. This is the best-loved masticating juicer and not just by me - it's got 2000 reviews on Amazon with a rating of 4.6 out of 5 stars. ​It's as "slow juicer" as it gets, working at 80 RPM to "squeeze" out heat-less, high quality juice. It's also easy to clean and operates quietly. 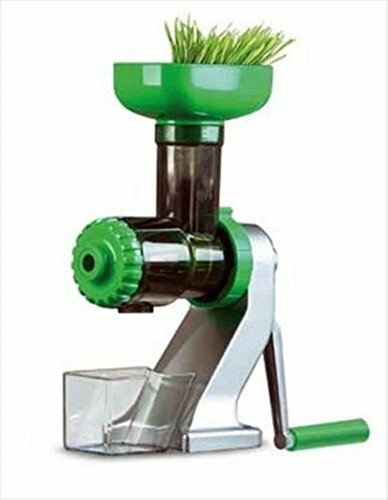 Best part it that it's great for greens, including wheatgrass, and it's multi-functional so you can use it as a food processor, pasta extruder, homogenizer, and grinder. The twin gear, triturating juicers are the champions of the juicer world - they are the top-of-the line, cream-of-the-crop among mainstream juicing machines. 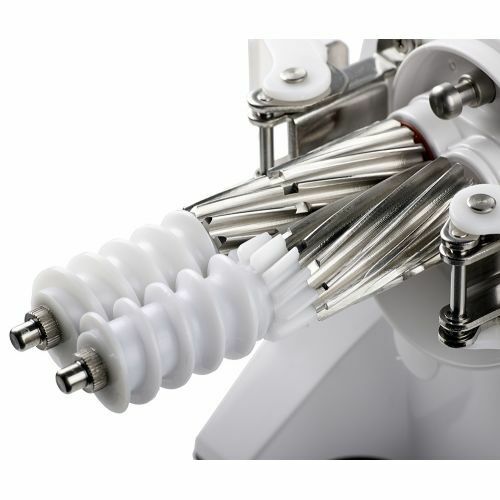 These juicers extract fresh juice from produce using twin gears that interlock with each other while rotating inwards - crushing everything you put between them into a very dry pulp. These juicers are super versatile and can juice pretty much every type of fruit and vegetable - including hard, fibrous veggies such as celery and apples, as well as soft fruits and leafy greens. Actually, leafy greens juice particularly well in these juicers thanks to the high pressure exerted by the interlocking gears. Find out full details about the pros and cons of twin gear juicers! Just as you wouldn't buy a Hummer when all you plan on doing is driving to and from work on local roads, there's no need to spring for a triturating juicer unless you really have use for it. It's also one of the best overall juicers. Ever.​ As they say, it is the only juicer you'll ever need. And of course, it extracts extremely high juice yield of the best quality juice, making it our #1 pick for triturating juicers. Hydraulic press juicers are in a class of their own...and it's top-notch but not necessarily a class you need to partake in. These juicers (machines) produce the best quality juice, but they also require more time, effort, and money than the average juicer (person) needs to spend. And in case you're interested and wondering what juicers are available in this category - well, no review of hydraulic press juicers would be complete without a mention of the aptly named Ultimate Norwalk Juicer. This is the cream of the crop when it comes to all juicers. Form inception it set the standard for hydraulic press juicers, and it retains this solid reputation to this day. A great option is the Samson Welles Juice Press (or People’s Press). It currently retails at $399.00. This costs a lot less that the Norwalk, but it would still produce the same superior quality juices. If you’re a very committed juicer who must have the best and you're willing to put in more time and effort for better juice quality - this is definitely the best option for you. As the name implies, manual juicers are operated by hand. They don't require electricity - just elbow grease - and are relatively inexpensive and usually easier to clean than their electric counterparts. The downside to manual juicers is the range of fruits and veggies that they can juice. Manual juicers are generally very basic tools that serve to squeeze the juice out of a fruit, much like you'd do by hand. 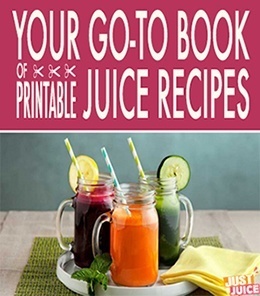 Most of the manual juicers on the market are either citrus juicers or wheatgrass juicers. Citrus juicers can only juice various types of citrus fruits (and can't juice the peels), but most manual wheatgrass juicers also do a pretty awesome job of juicing other produce as well - especially leafy greens. Manual citrus juicers really vary in price. You can opt for a simple but very functional juicer such as MSC's silicone citrus juicer for less than $10. 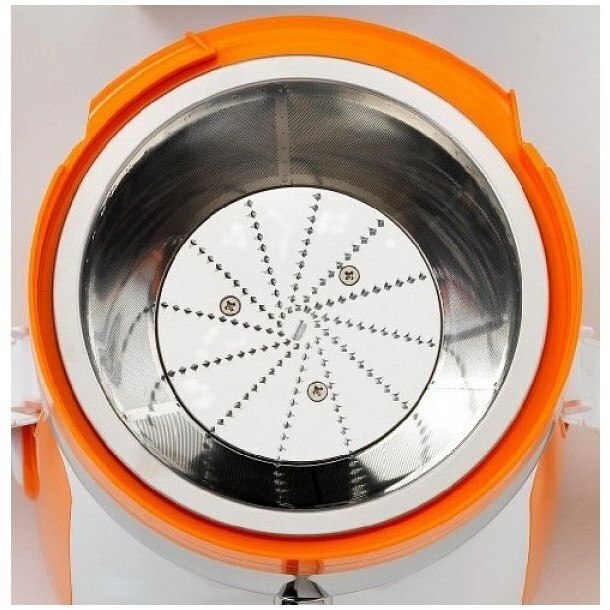 Or you can opt for a sleek manual press citrus juicer, for which the price range is anywhere from $35.00 to $190.00! Take, for example, this citrus juicer by Hamilton Beach on Amazon for $188.60. A huge advantage of manual wheatgrass juicers to citrus juicers is the wider variety of produce you can juice. 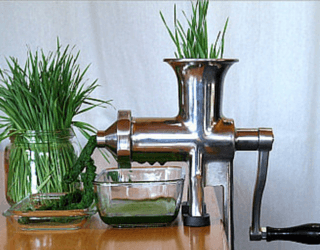 The best wheatgrass juicers do a great job of juicing wheatgrass and other leafy greens as well as several other kinds of (hard) produce. 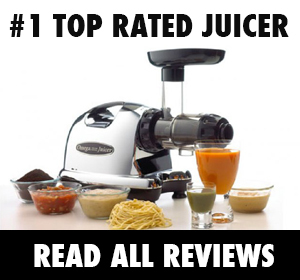 Read reviews of the best manual juicers! Manual juicers are a worthwhile investment if you're looking to try out juicing and don't want to invest too much since if juicing works out, you can opt for a more versatile juicer AND still keep the manual juicer as a traveling companion or for when you just want to juice leafy greens without taking a lot of time to clean up. 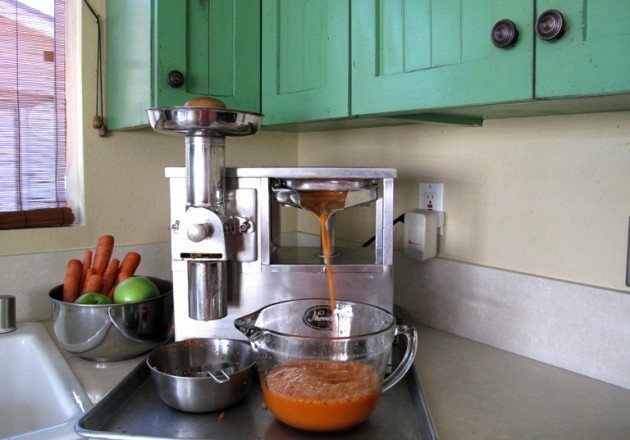 Actually, I'd recommend a manual juicer for pretty much everyone just starting out - they allow you to juice enough produce to make the healthiest kinds of juices (delicate leafy greens like wheatgrass, sprouts, arugula, etc as well as more "tough" veggies like cabbage) and they're great for juicing hard produce like apples, carrots, and beets to add some sweetness to your green juices. 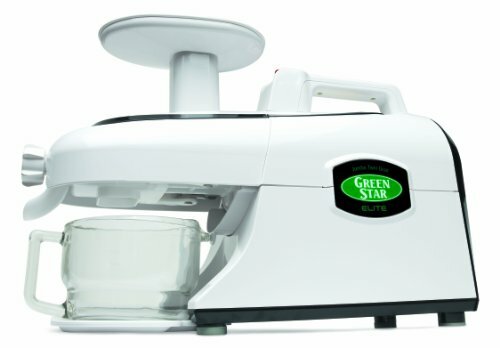 The Z-Star is hands down the best manual juicer on the market, mainly because it's basically a single auger, masticating type of juicer without the motor, which means the same process of extraction with no heat and better preservation of nutrients and enzymes. It's great with leafy greens and you can also juice harder produce like carrots, apples, ginger and even softer fruits like tomatoes. Bonus? It weighs 6lbs and makes a good portable juicer as well!